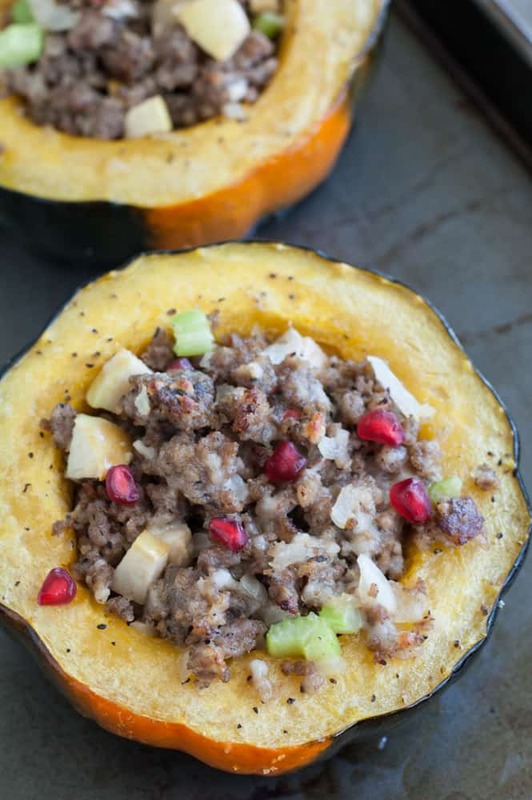 Sausage stuffed acorn squash is a little spicy, a little sweet and super flavorful. A delicious fall meal filled with sausage, cheese, Panko, apples, onion and celery. Over the years I have become a huge fan of squash. Believe it or not, the first time I tried an acorn squash was when I went home with my boyfriend, now husband, for Thanksgiving in college. His mom made the BEST acorn squash casserole and I have loved it ever since. 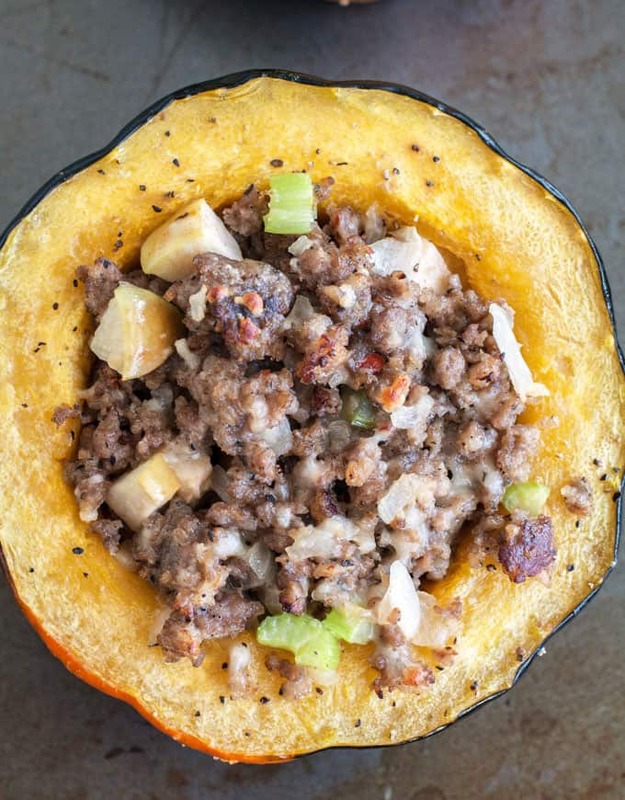 Acorn squashes are perfect for stuffing. They are just the right portion size for a hearty meal. This sausage stuffed is my favorite way to eat them. Start by seeding and roasting the squashes in the oven. Cut the ends off and then cut the squash in half. Scoop out all the seeds with a spoon and place on a baking sheet. Brush the insides and top of squash with olive oil. Roasting squash softens them up and brings out their rich flavor. While they are roasting, start the stuffing mixture. I like to use sage breakfast sausage. If you can’t find it, you can add 1/2 teaspoon of dried sage to the mixture. Brown the sausage and then add diced onion, celery and apple. Cook for a few minutes until softened. Stir in some Parmesan cheese and Panko bread crumbs. Fill the acorn squash halves with the mixture and then bake for 15 additional minutes. Once they are done baking, top with a little extra cheese if you like and a few pomegranate seeds for color. 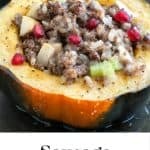 These stuffed squash are easy enough for a week night dinner and special enough to serve to guests. Enjoy! Cut ends of acorn squash then cut in half. Scoop seeds out of the center of each half and discard. Place squash halves on a baking pan and brush olive oil on inside and top of squash. Season with salt and pepper. Bake for 40 minutes. 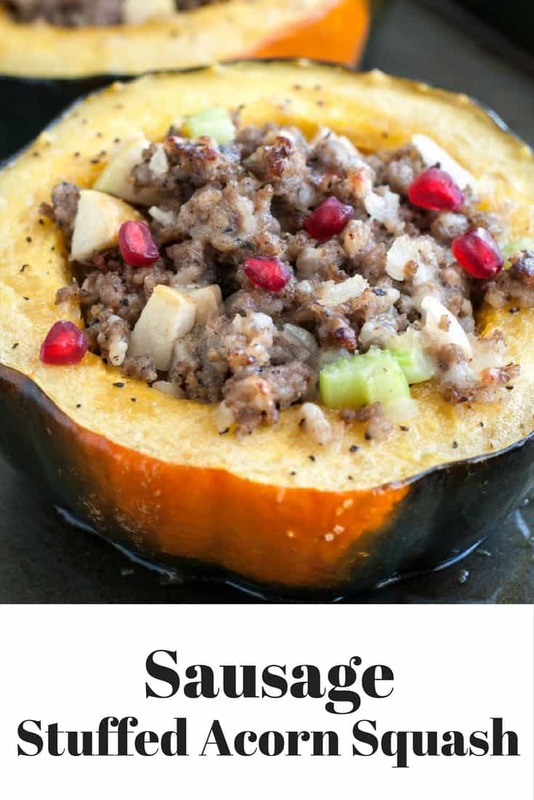 While squash is baking, cook and crumble sausage in a large skillet over medium heat. Drain excess grease and then add onion, celery and apple. Cook for another 4-5 minutes. Remove from heat and stir in cheese and Panko bread crumbs. Spoon mixture into the center of each squash. If you like, top with a little extra cheese and bake for an additional 15 minutes. Remove from oven and serve. Top with pomegranate seeds, optional.